Theory of Electromagnetic Well Logging provides a much-needed and complete analytical method for electromagnetic well logging technology. The book presents the physics and mathematics behind the effective measurement of rock properties using boreholes, allowing geophysicists, petrophysisists, geologists and engineers to interpret them in a more rigorous way. 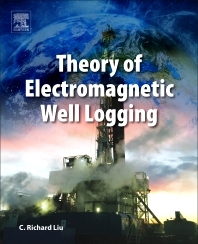 Starting with the fundamental concepts, the book then moves on to the more classic subject of wireline induction logging, before exploring the subject of LWD logging, concluding with new thoughts on electromagnetic telemetry. Theory of Electromagnetic Well Logging is the only book offering an in-depth discussion of the analytical and numerical techniques needed for expert use of those new logging techniques. Dr. Liu has been the director of well logging lab at the University of Houston for more than 26 years. He has worked on research projects related to microwave passive and active networks, RF circuit design, radio systems and networking, numerical computation of electromagnetic scattering and propagation, hardware and software design of ground-penetrating radar systems, electromagnetic tomography, microwave telecommunication systems, electrical properties of rocks, and well logging. He has graduated more than 50 Ph.D and MS students in the area of well logging and subsurface sensing. He has published more than 150 papers in this area.